Many state, county, and local agencies are faced with deteriorating bridge infrastructure composed of a large percentage of relatively short to medium span bridges. In many cases, these older structures are rolled or welded longitudinal steel stringers acting compositely with a reinforced concrete deck. Most of these bridges, although still in service, need some level of strengthening due to increases in legal live loads or loss of capacity due to deterioration. Although these bridges are overstressed in most instances, they do not warrant replacement; thus, structurally efficient but cost-effective means of strengthening needs to be employed. 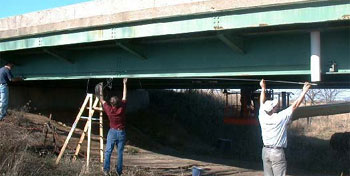 In the past, the use of bolted steel cover plates or angles was a common retrofit option for strengthening such bridges. However, the time and labor involved to attach such a strengthening system can sometimes be prohibitive. This project was funded through the Federal Highway Administration?s Innovative Bridge Research and Construction program. The goal is to retrofit an existing structurally deficient, three-span continuous steel stringer bridge using an innovative technique that involves the application of post-tensioning forces; the post-tensioning forces were applied using fiber reinforced polymer post-tensioning bars. When compared to other strengthening methods, the use of carbon fiber reinforced polymer composite materials is very appealing in that they are highly resistant to corrosion, have a low weight, and have a high tensile strength. Before the post-tensioning system was installed, a diagnostic load test was conducted on the subject bridge to establish a baseline behavior of the unstrengthened bridge. During the process of installing the post-tensioning hardware and stressing the system, both the bridge and the post-tensioning system were monitored. The installation of the hardware was followed by a follow-up diagnostic load test to assess the effectiveness of the post-tensioning strengthening system. Additional load tests were performed over a period of two years to identify any changes in the strengthening system with time. Laboratory testing of several typical carbon fiber reinforced polymer bar specimens was also conducted to more thoroughly understand their behavior. This report documents the design, installation, and field testing of the strengthening system and bridge. Installation of carbon fiber reinforced polymers (CFRP) post-tensioning bars.